The dining room on Ward East 18 at University Hospital Llandough will soon be transformed into a dementia friendly area thanks to a kind donation from Asda Leckwith. Ward East 18 was lucky to be chosen to take part in Asda’s green token scheme and Cardiff & Vale Health Charity received £500 to be spent on the ward to make improvements. Each year Asda invests over £1.4 million in over 4,000 good causes through their Green Token Giving Programme, giving back to organisations in your local area. Asda think it is important that they support the right people, and who better to choose local causes than the people who live in the area around their stores. 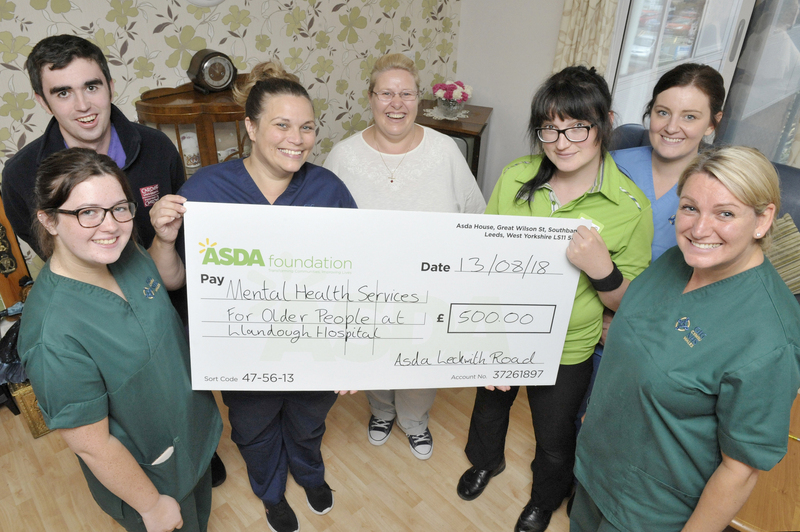 Kath Martinson, Refocussing Nurse on East 18 said: “I’d like to say a huge ‘Thank you’ to Sarah Bennett at Asda Leckwith and the customers that voted for us and for the generous donation from Asda. “We are in the process of making some improvements to the ward and this donation will be a great help. “Our lounge and dining area are quite clinical looking and the aim is to make this environment more dementia friendly. Some ideas we have are to make a feature of one walls in the lounge by papering it and adding a fireplace. We would also like to purchase tablecloths, serviette holders and other items to make the dining room more attractive.